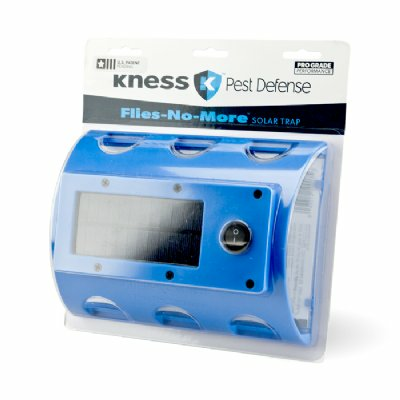 Flies-No-More™ Solar Traps are custom designed to trap house flies, cluster flies, barn flies and other flying insect pests. 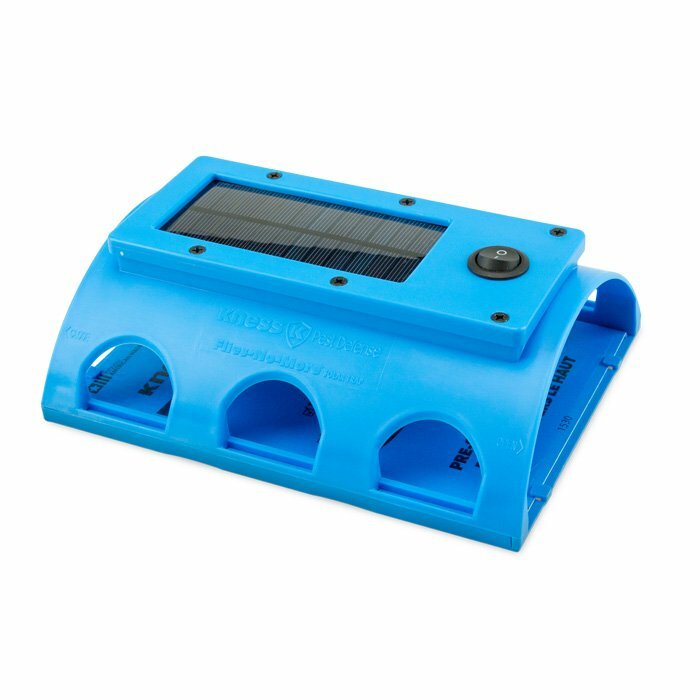 Innovative features include LED light attractant; banana-scented glue board designed to attract flies and other insects; visually appealing durable molded plastic construction; easy inspection and easy replacement of glue board; large trapping area. Remove the cover by firmly holding the base and pulling the cover toward the OPEN tab located on one end of the cover. With the cover removed, place glue trap, glue side up, on the center of base making sure the glue trap is under the tabs on both ends. Pull the paper backing off of the glue board. Firmly hold the base and slide the cover onto the base in the direction of the CLOSE arrow located at the other end of the cover. Made of polypropylene, resistant to stains and odors. Flies-No-More™ Solar Traps are easy to clean and can be reused. Glue board can be disposed of after pests are caught. 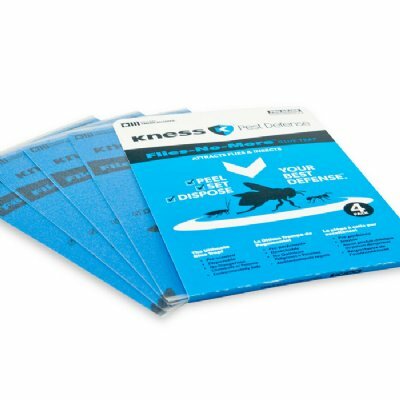 Specific colors are used for luring and capturing house flies, cluster flies, barn flies and other flying insect pests. Solar panel to recharge internal battery. Made specifically to attract flies and other flying insects. Glue board in combination with LED lights provide for a quick catch rate. Designed for many years of use. The molded plastic construction is both durable and visually appealing. Vertical or horizontal easy wall installation. Allows for easy inspection and replacement of glue board. Front of trap allows for larger trapping area. Allows for placement in a variety of areas. Inspection is easy and convenient, as most of the captured insects are hidden from plain sight. Inspection of glue board does not require removing any shields or parts. Each trap comes with glue board for retail and pest control professionals.